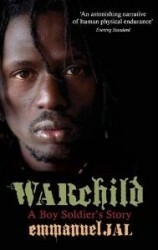 Emmanuel Jal was only eight years old when he was taken from his family home to become a child soldier with the rebel army in Sudan’s bloody civil war for nearly five years. Beaten, starved and brutalised Emmanuel was put into battle in Ethiopia and southern Sudan carrying an AK-47 talller than himself. He attempted to leave the SPLA but was hunted down and thrown into a desert prison. He finally escaped and is now an internationally-acclaimed rap artist spreading messages of peace and reconciliation with his unique style of gospel rap. Written with Megan Lloyd Davies. Fast-paced... stark... a provocative challenge. There's no glamour here, no pitched battles, only unimaginable misery... Utterly grounded, specific and real... You'll come away from this book loving Emmanuel Jal. Frank, unsparing...[A] searing portrait of a war-torn youth turned community advocate and role model. The astonishing and often harrowing story of how the author, carrying an AK-47 taller than he was, became one of "the Lost Boys of Sudan" - a child soldier - before finding a new life in hip hop.